We’ve put the Parsley back in our Health Greens! 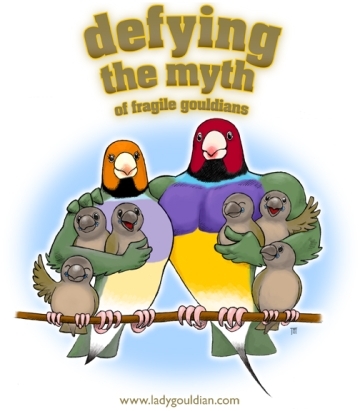 While most finches relish fresh greens, many Gouldian owners know that this is not always the case for their birds. Our dried Health Greens provide many of the same benefits as their fresh counterpart and are readily accepted by most finches. My Gouldians love it and eagerly fly to the dish before my hand is out of the enclosure! 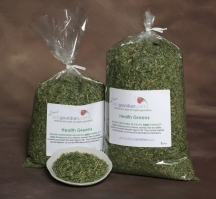 The health benefits of alfalfa have been known for centuries dating back to ancient Greece. They used alfalfa to treat a variety of diseases including bladder and kidney conditions. Traditional Chinese medicine uses alfalfa to treat kidney stones. Alfalfa has been used as a human food and herbal medicine for at least 1500 years. Alfalfa contains vitamins (A, E, B6, K and D), minerals (calcium, iron, manganese, potassium, phosphorus, chlorine, sodium and magnesium) and contains more protein than beef, eggs and milk. It contains many essential enzymes and aids in digestion. The high nutritional value of parsley comes from its vitamin A and vitamin C content. Parsley contains twice as much iron as spinach and it is a good source of manganese, calcium and potassium. Parsley is one of the most important herbs for providing vitamins to the body. It’s like an immune-enhancing multi-vitamin and mineral complex in green plant form. It grows in most climates and is readily available throughout the year. Parsley has also been used by both Chinese and German herbalists to enhance the kidney’s ability to excrete sodium and water, so parsley acts as a natural diuretic. Our mixture of parley to alfalfa is therefore 1 part parsley to 5 parts alfalfa, so your bird does not get enough parsley to cause dehydration.